Set in Antigua, Guatemala, Visible Signs tells the story of Mikela, a fierce ten year old indigenous girl determined to save her pregnant severely traumatized twelve year old sister, Natividad, and the child she carries. To save her sister, Mikela draws together an odd, engaging assortment of American women living in Antigua. What will happen to Mikela, Natividad and the baby becomes the central question of the novel. The children's situation resonates deeply with the central conflicts of each of the women drawn into this circle of care: Lourdes, an artist, who has taken a traveling fellowship to distance herself from the unexpected intrusion into her new marriage of an angry step-daughter mourning the death of her own mother; Ginny, a priest, who needs to find a new God to worship, one that can celebrate her sexuality rather than deny it; Rosemary, who must face the reality of death with the illness of her friend Ginger; and Wilma, Rosemary's Guatemalan housekeeper, who has lost her own son in the recent civil war and is a reluctant host to the many restless spirits of that conflict. 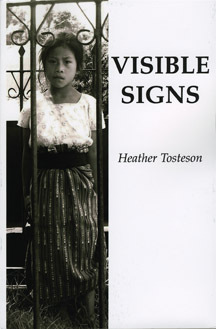 Visible Signs is a wonderful, oceanic sweep through several months in the lives of ten or eleven women in post-1980s Antigua, Guatemala. The women are indigenous, Guatemalan Spanish descendants, and short and long term expatriates from North America and France. They struggle and clash, work and learn with one another; they share their thoughts, cultures and energies, traumas, fears and loves. The stories include the struggle for survival and independence of Mikela and Natividad, two young orphan sisters, and the competing efforts of the other women to help them. Lourdes has recently come from the U.S. to reinvigorate her waning artistic spirit after her marriage reached an impasse. Gwen, Lourdes step-daughter and significant challenge, visits and engages immediately in the circle of women. Ginny is a priest who has come to recover her spirit after she was ingloriously and traumatically expelled from her congregation. Wilma, who lost her son in the civil war, works as cook, housekeeper, day planner, and anchor for insecure and controlling matriarch, Rosemary, who immigrated years ago with her now-deceased second husband and love of her life. The reader is taken effortlessly and masterfully back and forth through time, and shares in the thoughts, conversations, and activities of the many characters. In real time, we witness birth and death. We are taken into many churches; we visit new age healers; we participate in local customs during Easter. We hear the voices (often unwelcome) that speak in the minds of most of the characters. Above all, this is a vibrant, loving story about spirit and the good that comes from group effort to draw on spirit in the midst of conflict. Spirit dissolves and resolves struggles. Visible Signs is masterfully written, entertaining and insightful. It's wonderful. A ten year old girl must save herself and her twelve year old pregnant sister in Visible Signs, a conflict-filled novel set in Guatemala. The two native girls meet with a group of older American women who bring their own conflicts to the table and the new circle of friends seek aid from one another in this touching and spiritual story of cultural gaps closed to celebrate human nature. Deftly written and executed, "Visible Signs" is highly recommended to women's fiction shelves and for anyone who seeks a heartwarming story.